The eye-tracking set-up in the CSL lab is set up and running participants! 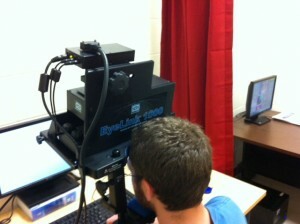 We have a tower-mount, as well as a desktop mount, for an Eye-link 1000. 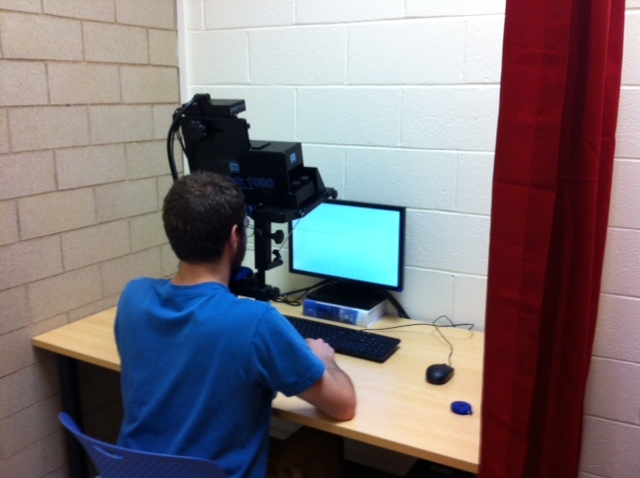 We’re currently running reading experiments, but the set-up is well equipped for visual world experiments as well. Come by and check it out! 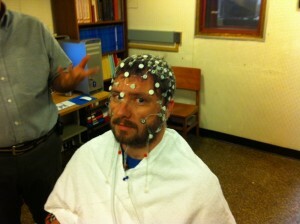 Jason participating in an experiment! Look at that minuteman maroon! This entry was posted in Other on April 17, 2012 by Brian Dillon. 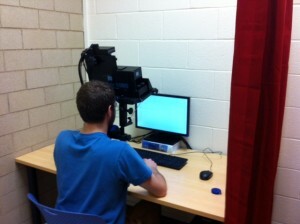 This entry was posted in Other on January 3, 2012 by Experimental Linguistics. The good folks over at EGI came by this morning to help us set up the EEG lab in the Phonetics Lab in the basement of Bartlett hall this morning. A bunch of folks got a crash course in the system, and we ran our first participant in a visual oddball paradigm. Kevin very graciously agreed to be the first participant in the new system, and after 10 minutes of data recording, we were able to crunch some EEG data and generate our first ERPs: Kevin showed a robust P300 response to oddball targets in a visual task! Data collection and analysis was a snap, and so we can look forward to lots of interesting data coming out of the Bartlett Basement EEG setup in the near future. Over the next several days there will be a number of other training sessions on various aspects of stimulus presentation, data collection, and data analysis. Come by the Barlett lab to check it out if you’re interested! This entry was posted in Other on October 25, 2011 by Brian Dillon. See you there! Meetings will be catered with some as-of-yet undetermined breakfast goodies. This entry was posted in Other on September 15, 2011 by Brian Dillon. Note: Not all of them are public – some are accessible only if you have a CU account. This entry was posted in Computational, Experimental, Other, Parsing, Phonetics, Phonology, Resources, Semantics, Syntax on August 19, 2011 by Magda Oiry. Hi all! Welcome to the new experimental Linguistics at UMass blog. We’ll keep you updated on the work, thinking, and events that are coming out of South College / Bartlett halls in a timely fashion. Stay tuned for news! This entry was posted in Other on August 12, 2011 by Experimental Linguistics.